Many are asking, What is the Big Deal About Bed Bugs! 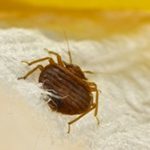 Bed bugs are showing up in many places, and more and more commercial and residential locations are needing bed bug pest control. Bed bugs feed on blood and come out at night to feed. They are small and can get into small cracks and crevices. Bed bugs are attracted to people sleeping and then begin to feed on them. People sometimes feel them feeding or may wake up and see blood spots on the sheets. They are appearing in hotels across the country. People can pick them up at a hotel and bring them home. Bed Bugs are difficult to control, so that’s why you need a professional pest control service to get rid of them. CALL TODAY FOR MORE INFORMATION ABOUT OUR BED BUG CONTROL! The poulation of bed bugs continue to increase in the area. The treatment of bed bugs is becoming more of our business each day. Getting rid of bed bugs can be a stressful process. We offer bed bug removal. Let the Sureguard Pest professionals remove bed bugs from your home or business. We offer the following services : bed bug control, get rid of bed bugs, getting rid of bed bugs, bed bug elimination, bed bug extermination, bed bug infestation, bed bug removal, control bed bugs, kill bed bugs, killing bed bugs call for your bed bug inspection.